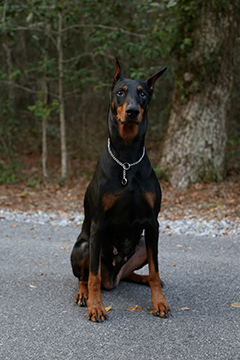 Brandi Williams-Overton has owned and trained Dobermans since 1997. She has worked and trained Dobermans in pet therapy, agility, obedience, and schutzhund. Cinders (aka Swift Run’s Volcan Masaya) was bred by Tammy Marshall-Weldon of Swift Run Dobermans (Thank you Tammy for this wonderful dog!). Masaya Dobermans only breeds occasionally. Masaya Dobermans strives to produce working Dobermans with stable loyal temperaments and good work ethic for obedience, search and rescue, schutzhund, agility, tracking, law enforcement, and protective home companions.